The Traverse of the Watzmann has been on the to-do list for quite a long time and in August 2015 we finally ticked it off! We started climbing up to Hocheck and Mittelspitze at around 10 am and after the first 500 hight meters we already knew this won`t be Maggy`s best day… Anja and Nici were heading in front with quite a good pace and had to stop a couple of times for her to close the lines. As the Mittelspitze 2713m) was quite crowded with all the people not doing the whole traverse but turning around at this point, we went straight to the just one meter lower Südspitze. The traverse is indeed breathtaking!!! We were once again (as almost every tour in 2015) blessed by the weathergod and had perfect conditions. The sky was clear blue, sun was strong and there was almost no wind. There are no really dangerous parts in the traverse and for experienced hikers even the wired parts are no problem, but you should always watch your step. We were lucky that there was not much traffic and we didn’t have to queue anywhere, except for one point where a group of very unexperienced people (at least accompanied by a guide) struggled at a B-part. 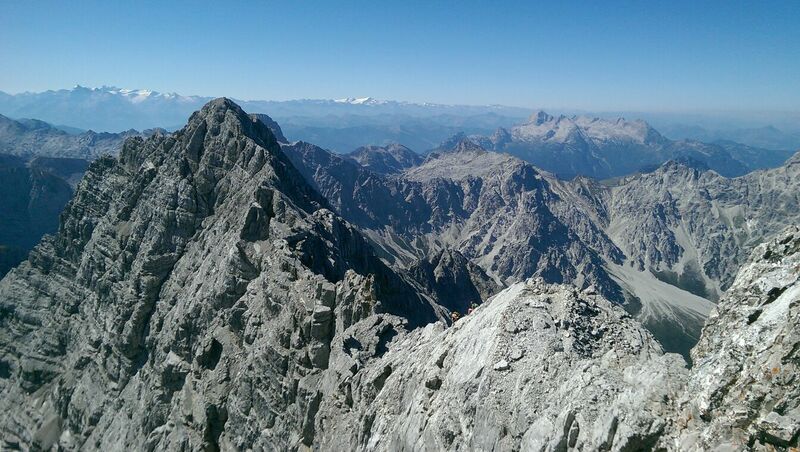 Once at the Südspitze, we sat down for quite a while and had a small lunch break. The view was awesome and we could even spot parts of the Dolomites and plenty of snow-covered peaks in the distance. Once more we learned that to fuel up your energy during all-day hikes and to carry enough water is essential! In the end we were happy that we didn`t do the full hike in one day. That may seems to be a challenge for the fit and is for sure doable, but you will definitely miss a lot of the beauty if you rush through it!